Miho Pine-forest (三保の松原, mihonomatsubara) is one of the new three views of Japan, located in Shimizu port, Shizuoka. It was very famous view spot for Mt. Fuji since Heian period (1200 years ago). The pine-forest is located on the beach, and has over 54,000 pine trees. Also, you can enjoy great view of Suruga Bay, and Izu Peninsula. There is parking, restroom and gift shops. 2. use Shizutetu Just Line to Mihomatsubara Iriguchi. It is the also the place of "Hagoromo Densetsu(Swan Maiden)." There is a 650 years old Pine tree, called "Hagoromo no Matsu." Legend said that was the tree that Japanese Angel put her close on. 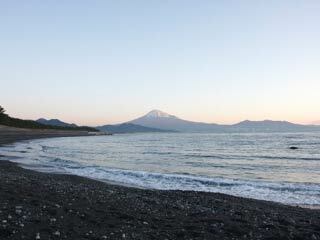 It is one of new three views of Japan, three major pine-forests, and also one of the 100 best pine-beach of Japan.